If I stand along the shores of Colington Island on a clear night, I can see the light from Bodie Island Lighthouse flash across the dark sky above the Albemarle Sound. Reaching 19 nautical miles, the 1,000-watt First order Fresnel lens turns on for 2.5 seconds, off for 2.5 seconds, and on again – then comes the 22.5-second break. I search for the light every time I’m there – and I know I’m not the only one. 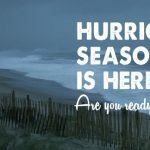 Three of the lighthouses along the Outer Banks coast are open for climbing and offer programing during the season, but all five are historically significant and worth a visit. Along with guiding ships that are navigating the rough seas of the Graveyard of the Atlantic for more than a century, Outer Banks’ lighthouses undoubtedly have become symbols of hope, strength and stability for those who have their feet firmly planted on the ground. Millions of visitors travel far and wide to climb their twisting stairways, photograph them or just stand in the shadow of their powerful presence. Brownie Trott, whose great grandfather Ephraim Meekins served as lightkeeper at Bodie Island Lighthouse from 1906 to 1919, now works at the Eastern National Bookstore located on the same grounds Meekins lived and worked for more than a decade. “To me, coming here feels like coming home,” said Trott, who has lived on Roanoke Island since she was born. Trott said she climbed the lighthouse for the first time this past week. Within a few hours’ drive of one another other, or even less, it’s quite possible to visit all of these during your stay. From full moon climbs to guided tours, these lighthouses each have their own stories that unfold for visitors each time they come onto their grounds or climb their windy stairs. Perhaps the most famous of the Outer Banks beacons is the Cape Hatteras Lighthouse. Built in 1870, this lighthouse stands at 210 feet and is the tallest in the United States. Its black and white candy cane stripes are recognized worldwide. The lighthouse weighs 3,000 tons. The beacon’s move farther away from the ocean in 1999 to escape erosion made international headlines. Climbing the 269 steps to the top of this lighthouse, which was constructed to help ships navigating the dangerous Diamond Shoals, is the equivalent of climbing a 12-story building. Forty-three miles to the north as you drive along N.C. 12, Bodie Island Lighthouse comes into view. Visitors can also climb the 214 steps of this lighthouse that stretches 170 feet into the air. 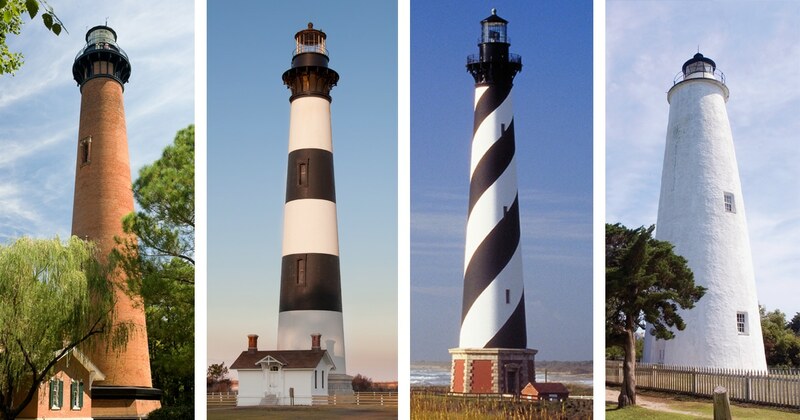 With the same color markings as the Cape Hatteras beacon, this lighthouse’s stripes are horizontal and its climb equals that of a 10-story building. The existing lighthouse is the third built on Bodie Island. The first one, built in 1948, had a faulty foundation causing the beacon to lean; the second was destroyed in 1861 by Confederate troops during the Civil War. The existing one, erected in 1872, underwent a major renovation that was completed in 2013 after going dark for about four years. Driving even further north, you’ll find the Currituck Beach Lighthouse located in historic Corolla Village. It was constructed using the same design plans as Bodie Island. One million red bricks were used to construct this beacon that is situated at on the grounds of Historic Corolla Park. Open to climbing, this lighthouse has 220 steps. The 20-second flash cycle of the Currituck Beach Lighthouse includes a three seconds on and 17 seconds off. There are two lighthouses on the Outer Banks that are not open for climbing, but offer as much of a draw to visitors. The Ocracoke Light Station, located on the south side of Silver Lake on Lighthouse Road, was built in 1823 and stands at 75 feet. There is limited, 15-minute parking. A narrow pathway takes visitors past the keeper’s quarters and to a fence at the foot of the lighthouse. The beehive shaped 4th order Frensel lens gives off a fixed continuous light from dusk to dawn, and the windows of the lantern room have a unique diagonal astragal design. 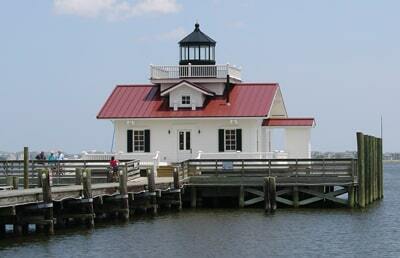 The Town of Manteo dedicated the Roanoke Marshes Lighthouse in the fall of 2004. The lighthouse, located on the Manteo waterfront, is a replica of the square cottage-style screw pile lighthouse that once stood at the southern entrance to the Croatan Sound, near Wanchese. The nearby Roanoke Island Maritime Museum has a permanent exhibit on the lighthouse’s history. Climbers must be at least 42 inches tall and able to climb independently. Children 11 years or younger must be accompanied by an adult who is at least 16 years of age. Running, jumping or stomping on the stairs and landings are prohibited. No eating or drinking other than water. Lighthouses may close at any time due to weather conditions. At Bodie Island, each climber must weight less than 260 pounds and only one person is allowed on each flight of stairs at a time. A waiver must be signed for unaccompanied children ages 13 to 17. Note: Climbs can be strenuous. There is no air-conditioning or elevators in the lighthouses. Climbs can be noisy, as well as hot and humid. Visitors with medical conditions should use their own discretion when deciding whether to climb.